This article was originally published on June 21, 2018 and expired on September 21, 2018. It is provided here for archival purposes and may contain dated information. L to R front row: Karson Sundberg, Kameron Hastings, and Ian Sundberg. With a heat index exceeding 105 degrees Monday, it might have been easy to get distracted during this year’s Illinois 4-H State Livestock Judging Contest. Despite the heat, 175 4-H members showed up to the University of Illinois campus physically and mentally prepared to tackle eight classes of live-animal evaluation, as well as question classes and three sets of oral reasons. The competition was just as hot as the temperature. Two 4-H members in the senior division were tied after the five hours of live placing and oral reason competition. Eric Shafer of Christian County edged out Emma Freebairn of LaSalle County for first place after the tie-breaking protocol was followed. Also participating from LaSalle County were Sundberg, Kara Freebairn, Dalton Walter, and Wayde Collins in the senior division. In the junior division, Karly Reel of LaSalle County took fourth place. Also participating from LaSalle County were Ian Sundberg, Kameron Hastings, and Karson Sundberg in the junior division. The contest is conducted by U of I animal science department staff and coordinated by Daniel Shike, Parker Henley, and Jack Oattes, in cooperation with U of I Extension 4-H animal science educator Dan Jennings. Lewis evaluated all the seniors in the beef oral reasons portion of the contest. In this part of the contest, contestants must give an oral defense of the placings they made earlier in the day during the live evaluation. “I’m looking for accuracy, first, but also good flow during their presentation,” Lewis said, adding the youth should strive to use correct livestock terminology and an engaging tone of voice during their oral defense. Lewis said his 4-H livestock judging experience prepared him for his role as a U of I teaching assistant where he lectures classes of 400 students. 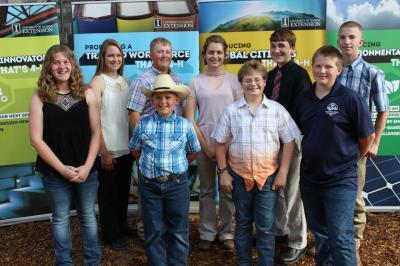 “4-H helps me with learning good time management,” Jasper County 4-H member Miranda Ochs said. Fellow teammate Will Ochs says he is learning skills he needs for improving his livestock operation, as well as improving his social skills. About 4-H: Illinois 4-H empowers and prepares Illinois youth for success. University of Illinois Extension provides 4-H programs in every county in Illinois, affecting the lives of 200,000 youth each year through sustained learning clubs, groups and short-term programming.